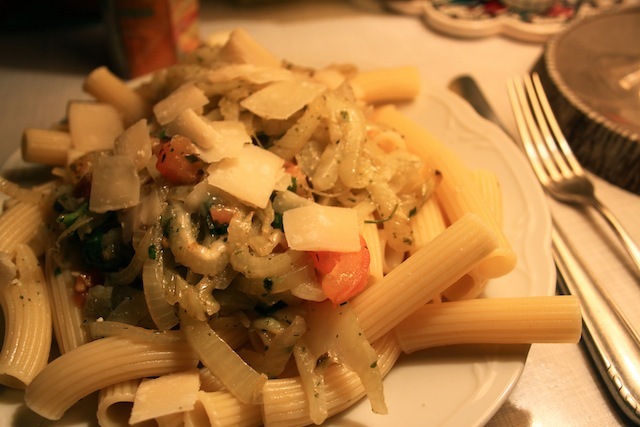 My Life Without an Appendix: Pasta with Fennel & Onions – Eat Me. Drink Me. It’s not so bad, really, to live without an appendix. It was nice, sometimes, to take walks with my appendix, to run errands with my appendix, even to have lunch with my appendix. But it wasn’t really until my appendix was gone, that I realized what it was to miss my appendix. I took walks, I ran errands, I ate lunch, and yet, I felt a hole, an appendix-shaped hole, right where my appendix used to be. It’s been a few months now, since my appendix was taken from me, and I feel a little solace, looking at the three small scars on my belly where at least something was given to me in exchange. I’ve grown to like those little scars, to like them almost more than I liked my appendix, since when I had it with me, I didn’t pay much attention to my appendix at all. I’m alone in Berlin now. It’s strange how, when there were people in the apartment, all I wanted was to be alone and quiet and now, when I’m alone and it’s quiet, all I want is someone else. This morning, I sent my mother off to the airport at six, and fell back into a cautious sleep. When I woke up, the apartment was already a different place. It was more silent, heavier; I was afraid of the sound of my voice. I’d never paid attention to my mother’s breath, but now that it wasn’t there, I knew what it was to miss her. I am not comparing my mother to my appendix. How grotesque. I’m only saying that we often spend more time clacking after what we don’t have rather than listening for the presence of the things that are with us. Our lives are in a flux of having and not having and almost always, what we have we will at some point lose. It’s only perspective, to think I have, rather than I have not, I won’t have, I don’t have anymore. So, I have: walls of books, two shelves of records and a record player that works, a little red bike, calm in which to work, big windows, walls around me and a roof above me, and somewhere outside of these walls, though I can’t see them or hear them, people who love me. Ella Fitzgerald kept me company as I made myself dinner for myself. 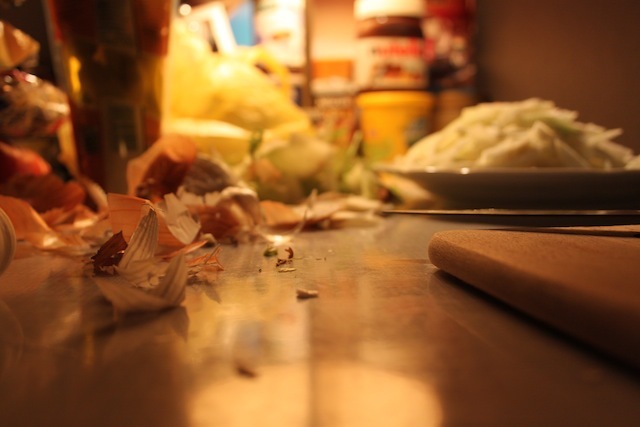 Yet there was something soothing in the familiarity of being at the stove, in hearing Ella’s voice and singing with her, in the rhythm of the chopping, that kept me thinking, have, have, have. Set a pot of salted water on to boil. When it’s boiling, throw pasta in the pot. In the meantime, heat olive oil in a skillet. Sauté onion, fennel, and garlic with salt, pepper, and sugar until the onion and fennel are soft. Add chopped basil and tomato. Maybe some more olive oil. Let it simmer just a bit. The tomato is like a new kid on the playground – it takes some time to make friends, weeks and years, sometimes, until a friendship forms. With the tomato, though, it’s not so long, maybe six minutes. Throw in some capers and toss everything together, the pasta and the onions and fennel, no gentle friendships here, and garnish with shaved parmesan. The fennel pasta sounds delicious. I hope you love the adventure and the solace of time alone in Germany.